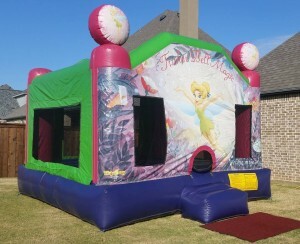 Jump City’s Tinker Bell Magic Bouncer! Fun and oh so pretty official fully licensed design! Strong colors brighten your children’s bounce house party. Let Tink’s magic brighten your daughter’s party! Jump City promotes healthy activity and safe jumping disguised as entertainment. It is so much fun to see their delight when guests see these bright happy units. Call today to book your TX bounce house rental for a child you love! This bounce house will keep your children entertained for hours on end! This jump house is one product in a fantastic line of bright airy jump houses delivered to Plano, Dallas, Frisco and other Texas Cities, like YOURS.